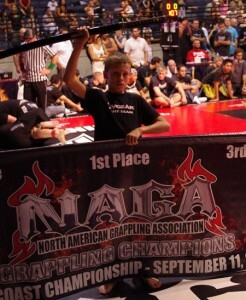 Revgear fighter Aidan Claproth competed at The NAGA Western Championship in Las Vegas, Nevada. He fought in the 60-69 lbs boys divisions in both GI and No-GI competitions. He got 2nd place in the No-GI division. And he placed 1st in the Gi division. Aidan was rewarded with Samurai Swords in both divisions. Congratulations, Aidan! The video below shows one of Aidan's exciting Gi matches.